Nowadays, many Android users are facing data theft related incidents. Whether someone believes or not, nearly every person’s data is stolen, or the user unknowingly allows itself. The extent comes when the user does not care about the security of their privacy despite knowing, as their privacy is nothing for them. But when a big data breach scandal comes to our knowledge, then we feel very frustrated and thought we have cheated by them. So before blaming anyone first, you’ll need to understand that the protection of Privacy is on your hand, even when you are online or using an Android Smartphone. How much Android Smartphone is safe for Privacy? Why all apps collect the data? Protect our Privacy on Android? The question always comes into our mind can we protect our privacy on Android Phone? or How to secure an Android Phone? 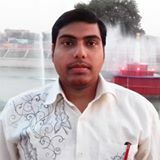 Android is developed by Google, So we think, it will give protection to our privacy. But you’ll be shocked, if I say your privacy is not secure if you use Android Phone. Even when you use any other company Phone such iOS-based iPhone, then also your privacy is leaking everywhere. As we know privacy is our personal information, such as info Name, Gender, Mobile Number, Cell Phone Model Number, Location, Contacts if you give to anyone, then it means you’re sharing your privacy with others. This is just an example, and this information came into your knowledge, so you got to know. But where to where our information is going we will never know. As you know when you signup for Google Account then you provide Your Name, Address, Mobile Number, etc… your information starts leaking. when you signup to any app for an account then again your privacy information is being collected. Sometimes you give the information and sometimes they spy with and without information. So once you start using Android your data is going to third parties, whether you want or not. Google created many apps for Android, Windows and iPhone devices and all the apps available for free to use but the condition is you’ll need to Agree to their Privacy Agreement & Terms of Usage. So after agreement acceptance, Google will start tracking everything. Google can easily get access to your Android Phone and all information anytime. Xiaomi RedMi 1S Phone Sending users data. The OnePlus #clipboard app contains a strange file called badword.txt. Government Official Namo App collecting unwanted Information. These are only a few samples if you search “Company Name Spying users data” or “Company Name Stealing users data” in the Google, you’ll get many results on this. Third Party apps are those apps that are not from Google and Phone developers and you install them from Google Play Store or from other sources. In a research the thing has come out that 7 out of 10 apps collect users data, so approx 70% apps spying users information and selling it to third parties. So today we can’t trust on any app because if Facebook can collect data from its Facebook and messenger app and the data has been leaked then why other apps can’t do this. Do Android apps steal our information without our permissions? Yes! approx all applications want to collect information from their users. Once you install any new app on Android and allow the permissions, then the app has necessary rights to get information from your device. Some apps ask to permit unwanted permissions that are not necessary to run the app but they ask because if you enable all the permission, then these apps will get more and more data from you with or without your permission. So Always double check the apps permission when you are permitting, if you have mistakenly allowed some, then manage the app permissions, and disable as on your behalf. Your Name, Search Information, Browsing Behavior, Device Information, Credit & Debit Card, Location, Installed Apps List, Contacts, Local Information saved on Storage. Today, Data is an importing thing to earn money. If anyone has more and more data, then they can earn huge money by selling it to third parties. You’re not only from that the data has been collecting. Suppose millions of people using the same application and their data is going to app developers then you can’t think how much the developer can make from your privacy info. While installing any new app double check the permission before allowing. If you want to check previously installed apps permissions, then Go to Settings » Apps and Notifications » App Info » Choose your app from the list » Permissions » Toggle button of a given permission if you think the access is not necessary for the app. Before installing any app, please check the app rating in the Google Play Store. App users always give a good & bad rating and share the experience after trying the app. If the app users have shared the good experience and the app has been rated with 4+ stars, then the app is good but it doesn’t mean, if the app has excellent rating then you’ll not have to check permission. The permissions that the app asks to permit you must check every time, so you’ll never fall into the data leakage problem. Internet Data Restriction is another solution, if you disable the Internet data to the app, then the app can’t use the Internet until you manually don’t open the app. That means the app can’t use the mobile data if it is running in the background and other apps that you’ll not restrict mobile data continue to use the Internet without any issue. Some good apps offer an option that disables information collection from your device. If you don’t know about the feature, then it can be found by doing a simple Google Search. When you install Whatsapp on your device, then it also asks for the permission to share your data with Facebook. But you can simply deny permission by disagreeing account information sharing to Facebook. Go to Phone Settings and tap on the Google Settings, in the Google tap on the Personal info & privacy. Now tap on the Activity controls settings. 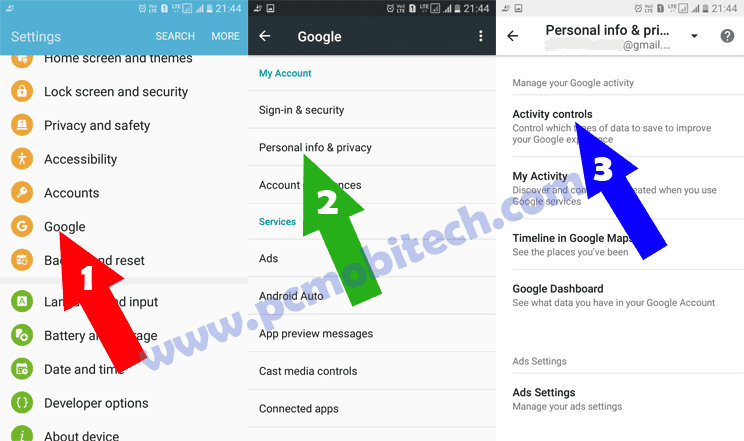 Once you come in the Activity controls settings, you will see Web & App Activity and other Phone activity settings that you have allowed to Google. These options help Google to track everything that you are doing on Android. 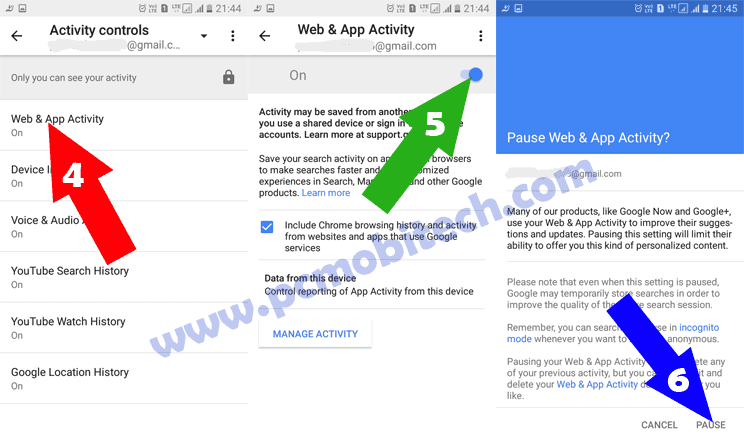 Along with the Web & App Activity, Google also gets Device Information, Voice & Audio Activity, YouTube Search History, YouTube Watch History, Google Locations History from Activity and Control Settings. First, you can turn off Web & App Activity option. Tap the Web & Activity option and you will see Blue toggle button on the top right section of the screen, to disable your activity tracking tap on the toggle button and next you’ll be asked for Pause Web & App Activity? Simply tap on the Pause option which is available at the bottom right section of the screen. If you would like to disable more tracking feature then you can do that in the Activity and Control Settings, so Google will not track your other info. But after pausing tracking activity, many Google features will stop working such as Google Mobile Tracking ability in the case when you lose your phone or someone has stolen your device, or you’ll not see any related searches, etc. How to reset default apps on Android? 3 Best Rooting apps for Android Phone. Howto use Google Maps offline on Android? And You can also check other apps settings such as Facebook app has the option which Uploads the contacts without your permissions. You can disable this option within Facebook App » Settings & Privacy » App Settings » Tap on Continuous Contacts Upload toggle button » TURN OFF the option. It will stop the Facebook app from uploading contacts to Facebook account. However, I’ll still recommend you to disable permission access on Android via Manage Permissions Settings and turn off all the permission except Storage for Facebook App. So Facebook will not get access to your SMS, Contacts, Calendar, Phone, Microphone, Location, Camera, etc., and the Facebook app won’t track you anymore. Conclusion: These are few hints if you use other apps and want to stop tracking feature then Manage Permission is the best option, which completely disables access to a Phone feature. But you can still get more information for them by doing a simple Google Search. Now as you can better understand you can’t completely protect your privacy on Android because each app on Android stores your information and sends it to their data server without your knowledge. So keep using fewer apps on Android, which will prevent your information sharing with third parties.